Our 100% Pure Amagansett Sea Salt, harvested by hand straight from the Atlantic Ocean in the Hamptons, with a short rest at our salt farm solar evaporating under the sun in the clean ocean breeze to the perfect flavor and consistency. Use our salt as a finishing salt and dress your foods sparingly - two to five crystals per bite is enough. Our salt is moderately coarse-grained and surprisingly “sweet” to give a pleasing, soft crunch and the perfect flavor. Fabulous on steak, seafood, vegetables, fruit, salads, chocolate. Try a light sprinkle on melon cubes - 2 or 3 salt crystals on each piece - fantastic! Put a few grains on a piece of caramel or chocolate - sea salt is the secret to making foods sweeter and transforms flavors to a whole new level! 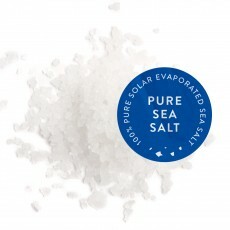 Amagansett Sea Salt has become one of EMP's most indispensable ingredients.... It's the only finishing salt you will find in our kitchen. Available in 1-ounce, 2½-ounce and 8-ounce net weight sizes, each in an attractive glass jar that looks great on a countertop.